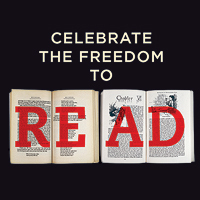 It's that time of year again: Banned Books Week. This week (September 30-October 6) is simply intended to raise awareness of recent book bans and challenges and the reasoning behind the majority of them. If you would like more information about this week and about the books themselves, you can visit the ALA's website or the new Banned Books Week website. Don't forget to check with local libraries and bookstores as many are hosting events specifically for this week. Keep reading!